During the early 1990’s while I lived in Sacramento, I spent a lot of time exploring the nearby Sierra Nevada – my first true mountain experience after cutting my entomological teeth in my beloved Ozark Highlands. The beauty of the Sierra is overwhelming (this should be obvious after my last several posts), and it didn’t take long for the deep, clear, blue waters of Lake Tahoe to capture my heart. One year ago, I returned to Lake Tahoe for the first time since moving back to St. Louis in 1995. That visit was much too short – only 3 days, but that was more than enough time to rekindle my love affair with Lake Tahoe. My wife shared those feelings, and together we made a commitment to return to Lake Tahoe every year from then on. And return we did. Our primary goals last week were skiing (to invigorate the body) and relaxation (to rejuvenate the mind) – typical goals for working professionals who spend much of the year consumed by the demands of job and family. In addition, I had another goal of my own – to learn as many of the trees and shrubs that occur in the Tahoe Basin as possible. I hadn’t done a very good job of this during the time that I lived in California – in those earlier days of insect collecting, I was content to call a pine a pine and a fir a fir and leave it at that. Over the years, however, I’ve become more and more interested in understanding host plant associations for the woodboring beetles that I study, and to do that I need to become a better botanist. With a whole week to explore the Tahoe Basin during this year’s trip, I figured I should be able to gain a solid understanding of most of the trees and a good portion of the shrubs that occur in the area. Maybe, if I was really lucky, I could actually succeed in finding and recognizing every species of conifer known from the Basin. To make a long story short – yes, I did succeed in building a solid understanding of most of the trees that occur in Tahoe Basin, including all 11 coniferous tree species. At this point, I have to acknowledge once again the considerable help given by a particularly knowledgeable associate at the U.S.D.A. Forest Service headquarters in South Lake Tahoe. Without her focused insight on distinguishing characters and locations, I may not have enjoyed the same level of success. From my discussions with her and what I had gleaned from my readings up to that point, I knew I would have to explore a range of habitats and elevations to find everything I was looking for, always with field guides and camera in pocket. This post represents the first of a two-part treatment of the coniferous trees that occur naturally in the Tahoe Basin and covers the six species of pine¹ (family Pinaceae, genus Pinus). The second part in this series will cover the remaining conifers in other genera. 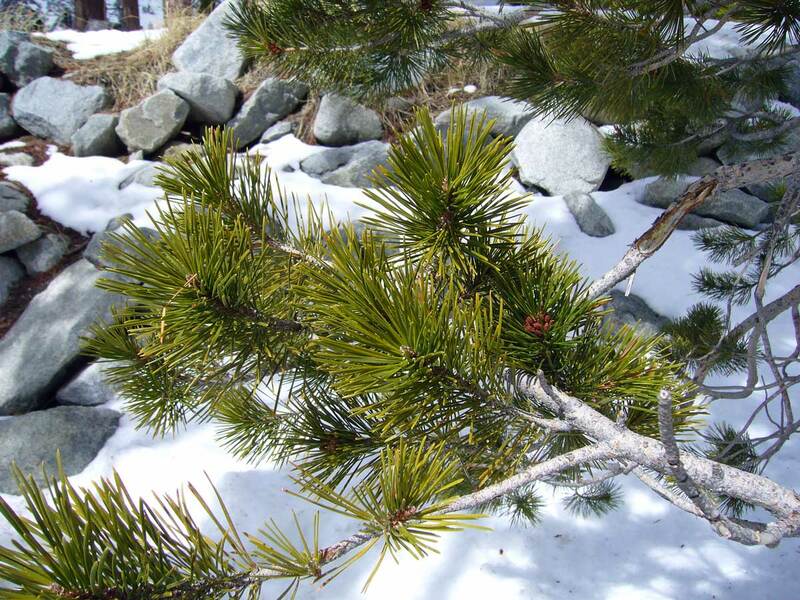 ¹ Two additional species of pine – Washoe pine (Pinus washoensis) and single-leaf pinyon pine (P. monophylla) – are often treated as occurring in the Lake Tahoe area. However, they are of sporadic occurrence on the eastern slopes of Mount Rose, and thus do not occur within the Tahoe Basin proper. In the treatments that follow, click on any of the photos to see enlarged versions for a better view of the characters discussed. 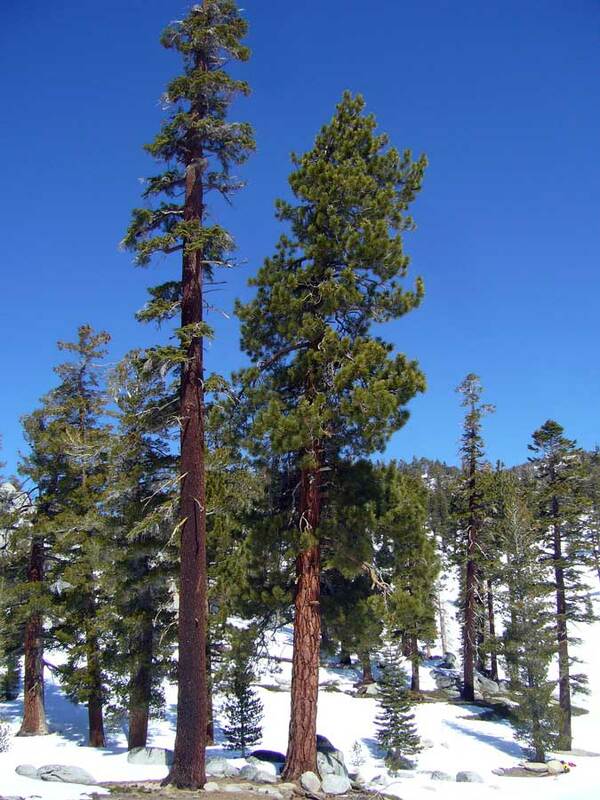 This is the dominant conifer and pine species in the Tahoe Basin. It is very closely related to ponderosa pine – so much so that some authors have treated it as a variety or synonym of the latter. Here, I follow the opinion of Conifers of California by Ronald M. Lanner (1999), who notes important differences in the chemical composition of its oleoresin (containing an explosive hydrocarbon called normal heptane) in addition to the subtle phenotypic characteristics. At a distance, the species can be recognized by its tall, straight massive trunk and relatively long, symmetrical crown. The bark is generally reddish brown with narrow plates between deep fissures. Like other species in the hard pine subgenus, old trees cease adding height after their crown flattens out (as seen in the photo above, which at first caused me to think it might be sugar pine). 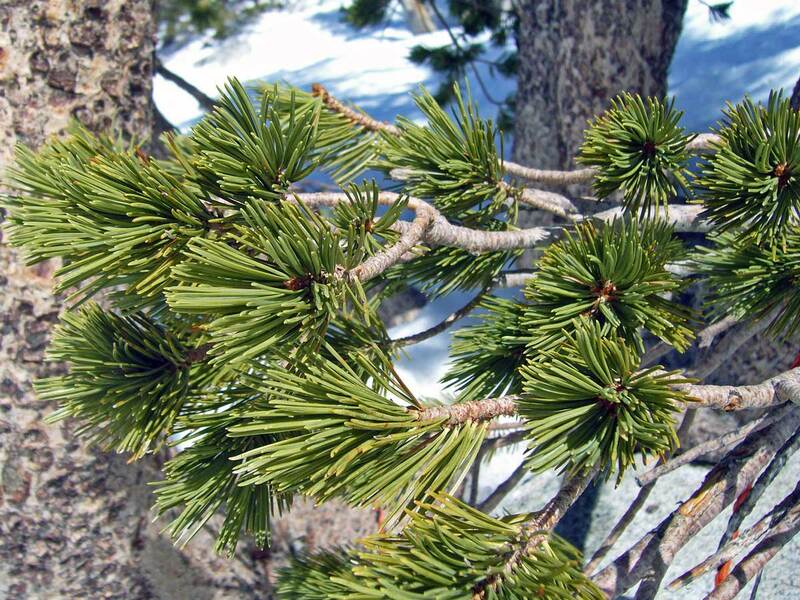 This species and ponderosa pine are the only Tahoe Basin pines that bear needles in bundles of three, and their length (up to 10″) and blue-green color also help to distinguish at a distance these two species from the other Tahoe Basin pines. I found the beehive shaped cones of Jeffrey pine to be the most reliable character for distinguishing this species from ponderosa pine – they are more robust, more tightly constructed, and easy to handle because the prickles of open cones curve inward. This species was the dominant pine at lake level around the entire perimeter of the lake. It also dominated the forests I saw at Spooner Lake (elevation 7,200′), and I saw a few specimens as high as about 8,000′ elevation at Heavenly Ski Resort. The photo at right shows this species (right) standing next to red fir, Abies magnifica (left) on the California side of Heavenly. I also found it outside Tahoe Basin on the western slope of the Sierra Nevada down to Pyramid Creek Geological Area at an elevation of about 6,200′. 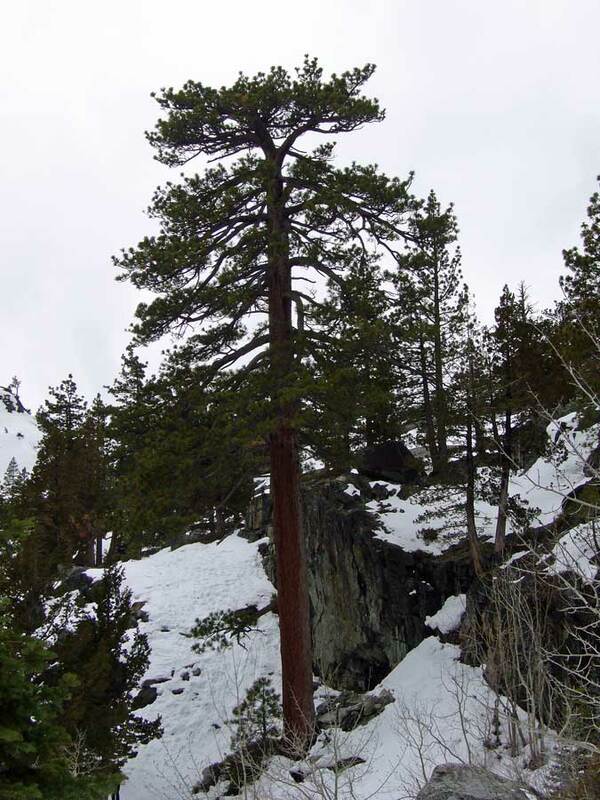 At that point, ponderosa pine began to take over and dominated at lower elevations. Despite the widespread occurrence of this species across the mountainous west, I knew this species was not common in the Tahoe Basin as it prefers somewhat lower elevations than Jeffrey pine. The U.S.D.A. Forest Service representative told me that I should be able to find this species in Emerald Bay State Park, and that proved to be the case. This species is so similar to Jeffrey pine that it is more useful to discuss the differences only. The photograph in Winter botany quiz #3 shows the more yellow, larger plates of the bark on mature trees that is usually cited as a distinguishing character, but I found this to be unreliable in deciding whether a large tree represented this species or Jeffrey pine. On several occasions I made a judgment based on the bark and then had to change my mind after looking at the fallen cones underneath. Furthermore, this character was useless for younger trees that have not yet developed the distinctive plating. Another character often cited is the shape of the crown, which in ponderosa pine is generally shorter and less symmetrical than that of Jeffrey pine and results in the branches starting higher up the trunk in mature trees. I didn’t develop any confidence in this character either. It was not until I started focusing on the fallen cones beneath each tree that I developed a consistent sense of which species was which. In contrast to the robust cones of Jeffrey pine, those of ponderosa pine were almost always slightly smaller, with a more open structure and – most obvious – were very prickly to hold due to the prickles of open cones curving outwards. 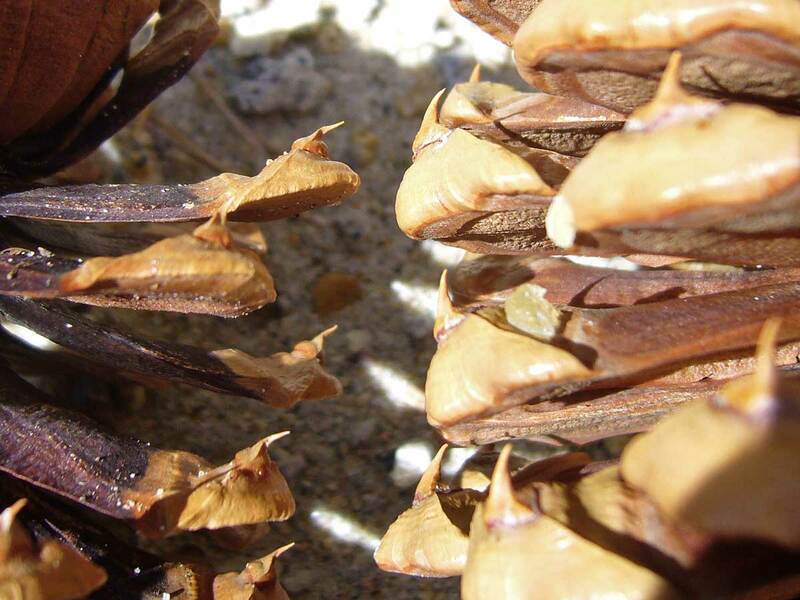 The photo at right shows the distinctly outward pointing prickles and more open structure of a ponderosa pine cone (left) versus the distinctly inward pointing prickles of a Jeffrey pine cone (right). Within Tahoe Basin proper, I didn’t see any trees that I thought represented this species outside of Emerald Bay State Park, where it occurred together with Jeffrey pine in mixed stands. At higher elevations, Jeffrey pine took over exclusively, while at lower elevations (outside Tahoe Basin, on the western slope of the Sierra Nevada), ponderosa pine eventually took over. I saw both species in the area of Pyramid Creek Geological Area (about 6,200′ elevation – the same as lake surface within Tahoe Basin). If there was any pine that I most looked forward to finding on this trip, it was this one². 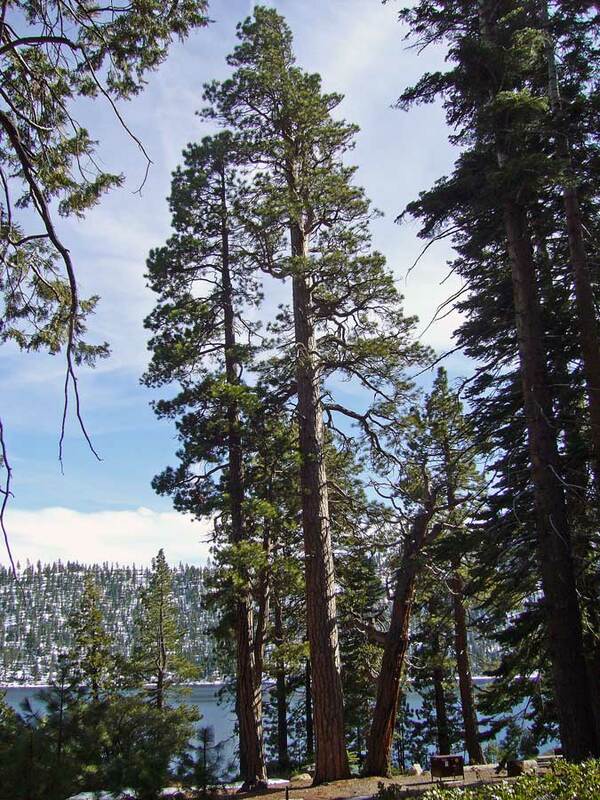 In contrast to the straight, narrow-crowned Jeffrey pines that dominate the Tahoe Basin, mature sugar pines have a ragged quality to them that makes each one unique. Or at least that was the feeling that I got from my readings. 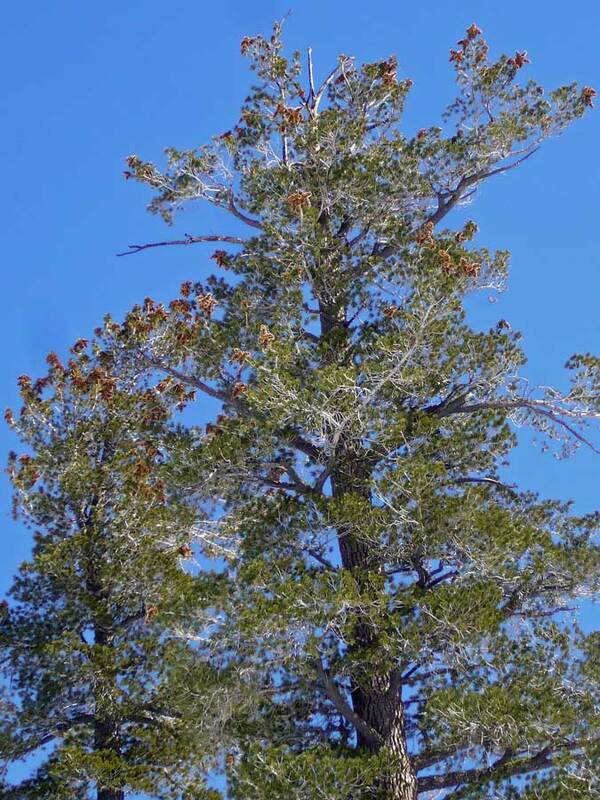 I had seen the giant cones of this tree before up around Tahoe City, but I had never before made the effort to find and recognized the tree itself – to say unequivocally “Wow, that’s a sugar pine!” The wonderfully knowledgeable U.S.D.A. Forest Service associate had told me I might be able to find it along the Vikingsholm and Rubicon Trails at Emerald Bay State Park, but better stands could be found further north along the west shore at D. L. Bliss and Sugar Pine Point (of course) State Parks. In addition to its distinct crown – tapering, frond-like branches that arch upwards in the upper crown and droop gracefully at the tips, while spreading horizontally below – sugar pine is immediately recognizable from a distance by the long, pendulous cones (usually a foot or more in length) hanging from the branch tips. It wasn’t long into my hike on the Vikingsholm Trail before I spotted the distinctive cones on a tree down by Vikingsholm Castle. Up close, the bark of mature trees is dark reddish and narrowly fissured, similar to Jeffrey pine but not so distinctly “plated.” Younger trees not yet bearing cones lack such distinctive characters, but they can still be recognized by their needles in bundles of five (about 4″ in length, much shorter than Jeffrey and ponderosa pine) – which places them in the soft pine subgenus – and smooth, gray bark. 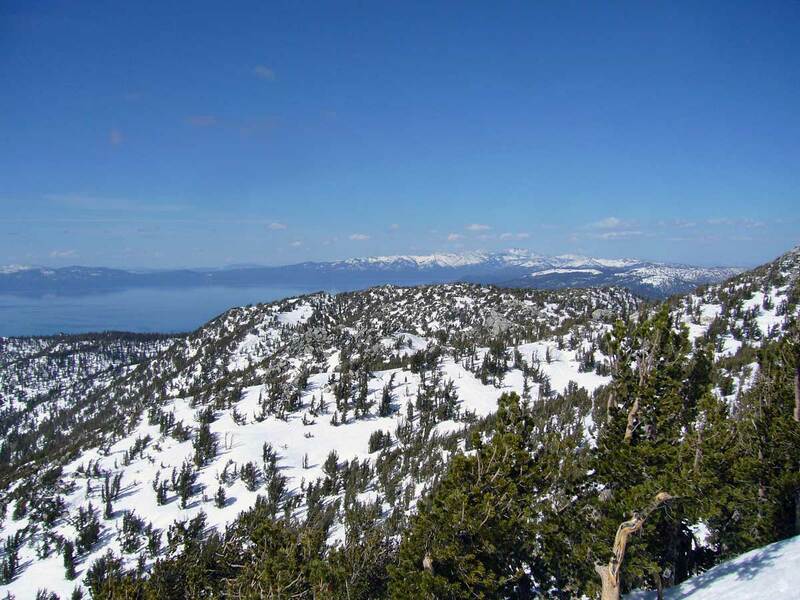 There are three soft pine species in the Tahoe Basin, but the other two – western white pine and whitebark pine – are found at higher altitudes than lake level. After hiking at Emerald Bay State Park, I drove up to D. L. Bliss State Park, and even from the road the towering asymmetrical crowns were immediately recognizable. Rising like giant monuments, these largest of pines were full of character and stood in defiant contrast to the uniformly symmetrical crowns of the Jeffrey pines and white firs (Abies concolor) that surrounded them. I would see this species along the entire western shore – just uncommonly enough to make each new sighting a delight. This species appears to favor the greater moisture of the western shore, as I only saw a single tree of this species while driving the eastern shore in Nevada. ² I equally looked forward to seeing whitebark pine, but I knew I would find good stands of this hauntingly beautiful species on the high peaks at Heavenly Ski Resort, where I had seen and recognized it for what it was during last year’s trip. I wasn’t sure I would find this species at first – my readings suggested, and the U.S.D.A. Forest Service associate confirmed, that I would need to visit higher altitudes than around the lake to find this species. I held out hope that I might see it on my final day during the trip, when we went skiing at Heavenly Ski Resort. This species is another member of the soft pine subgenus, with its needles in bundles of five and looking very similar to those of the closely related sugar pine. I learned, were I to find it, that its crown of horizontal branches would appear more tightly and neatly layered, and that the upward arching branches of the upper crown would not droop at their tips. 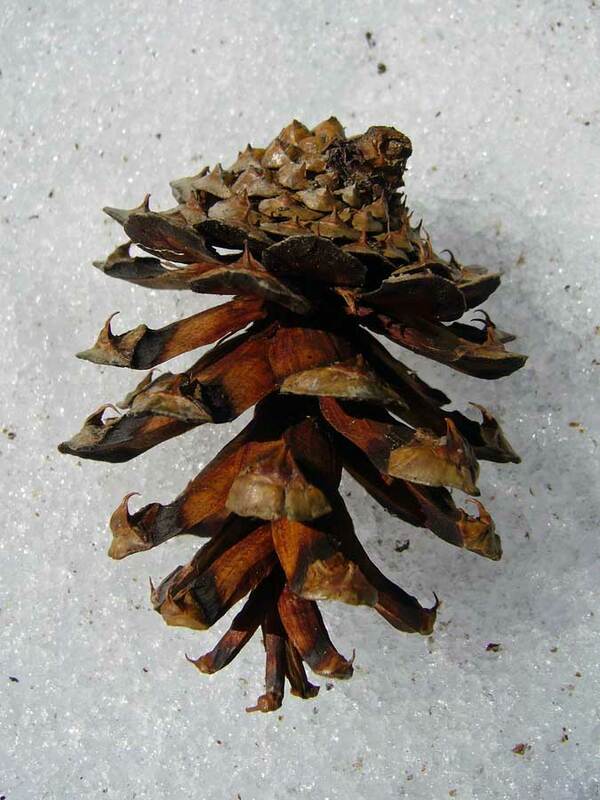 I also learned that the cones, smaller than those of sugar pine, would cluster erectly at the tips of the branches rather than hanging pendulously. My skepticism at being able to find and recognize this tree would prove to be unfounded. 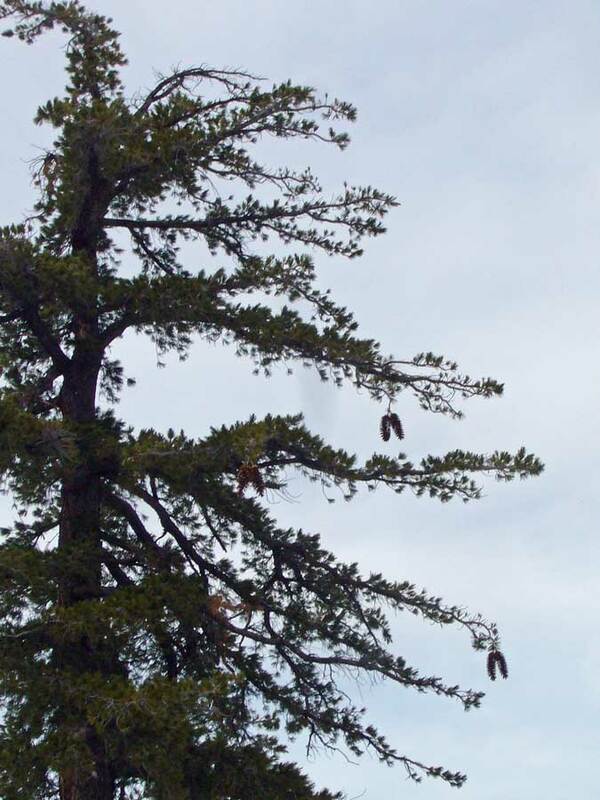 As soon as I reached the upper elevations of the ski resort, the robust, mature trees of this species were immediately recognizable – the crown shape and shape of the hanging cones were unmistakable. 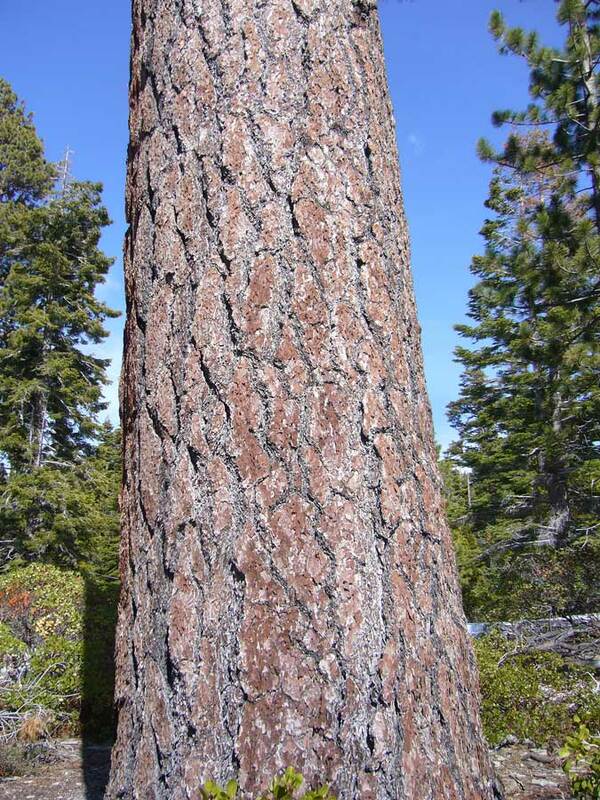 The foliage and young bark resembles that of sugar pine, but older trees quickly develop a thick, deeply-fissured, dark, purplish-brown bark that has a checkered appearance. They’re not as tall as sugar pine, but stouter and more robust. The trunks of some of the trees I saw were as massive as the largest ponderosa pines I had seen down near Vikingsholm Castle. I saw this species at elevations above about 8,000′ on both the California and the Nevada sides of Heavenly Ski Resort. 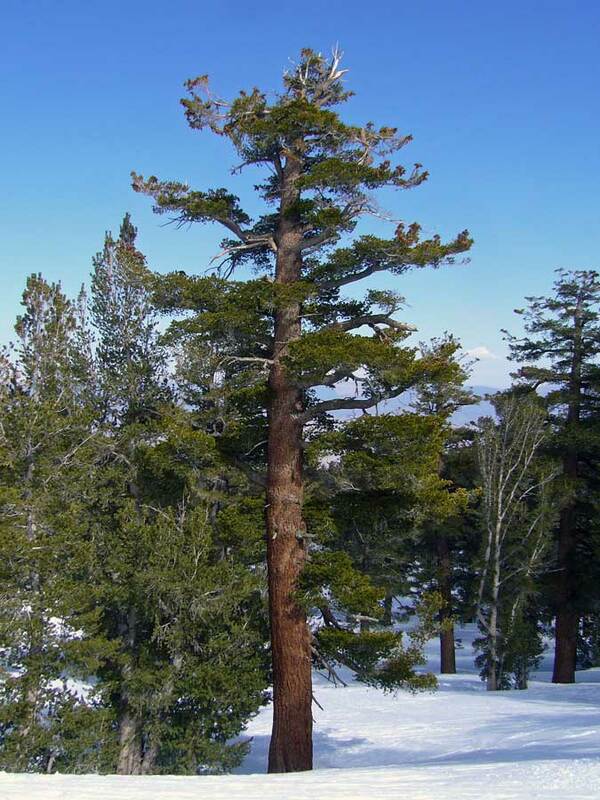 In the Jeffrey pine dominated zone around the Tahoe Basin, lodgepole pine is the second most common pine species. It is also one of the most easily recognized species due to its thin, flaky bark – light, brownish-gray in color and almost appearing orange from a distance, brown and gray mottled up close. I recognized this as something different right away when I started noticing nearly uniform stands in the wet meadow areas around the southern lake shore. It’s not as big as the Jeffrey and other pines I’ve discussed, and although the trunk is straight as in the others, the crown tends to be narrower. 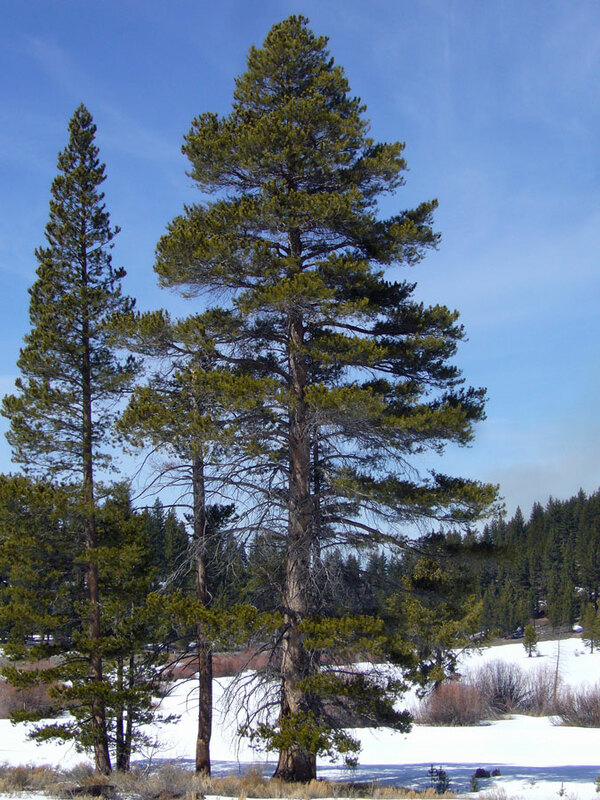 It has the shortest needles of any of the Tahoe Basin pines – only about 2″ – and is also the only pine in the area with its needles in bundles of two – all other Tahoe Basin pine species have needles in bundles of three (Jeffrey and ponderosa) or five (sugar, western white, and whitebark). 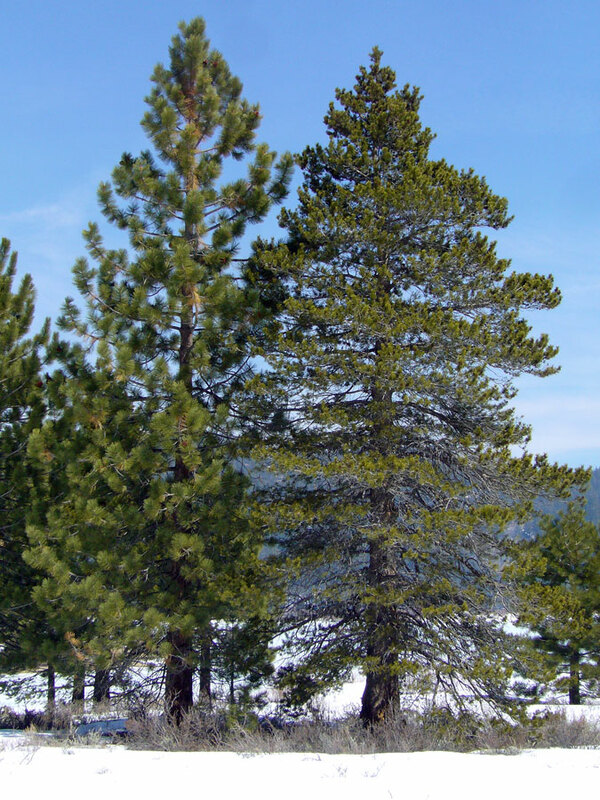 This gives the foliage a finer, more delicate appearance, as seen in the photo at right with lodgepole pine on the right and Jeffrey pine on the left. 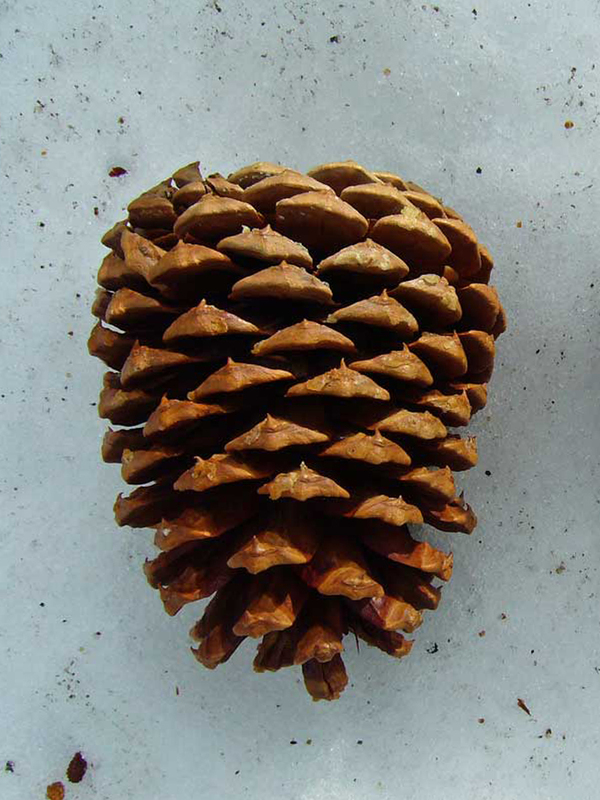 Lodgepole pine cones are quite small, only about 2″ in length, with an open structure and distinctive dark tips that contrast strongly with the brown scale bases. I found this species sporadically throughout the forests along the Vikingsholm and Rubicon Trails when I hiked Emerald State Park; however, the best stands were seen in the meadows along the Upper Truckee River near the city of South Lake Tahoe and while cross-country skiing around Spooner Meadow near Spooner Lake in Nevada (elevation about 7,000′). 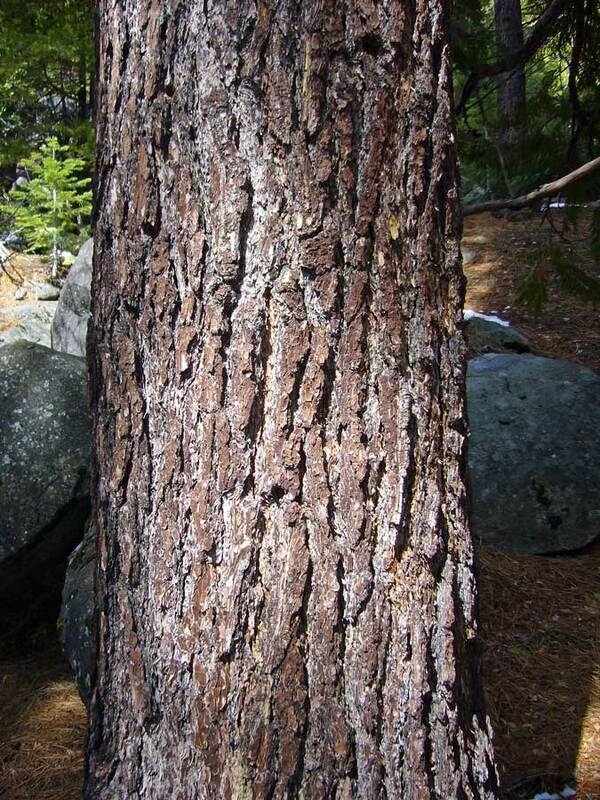 This species likes moisture and is the dominant pine in the many wet meadow areas that are found in the Tahoe Basin. 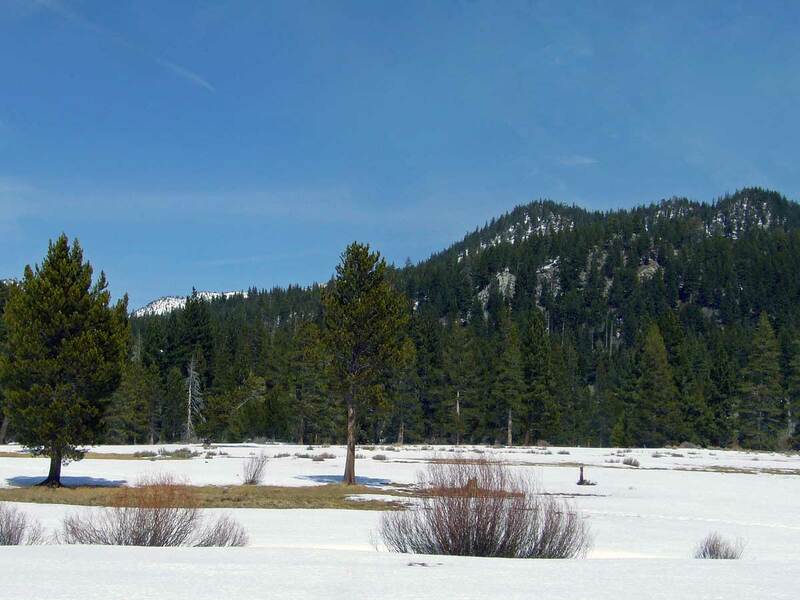 The photo below was taken at Spooner Meadow and shows the stands of lodgepole pine in the meadow, with Jeffrey pine taking over on the elevated hillsides. 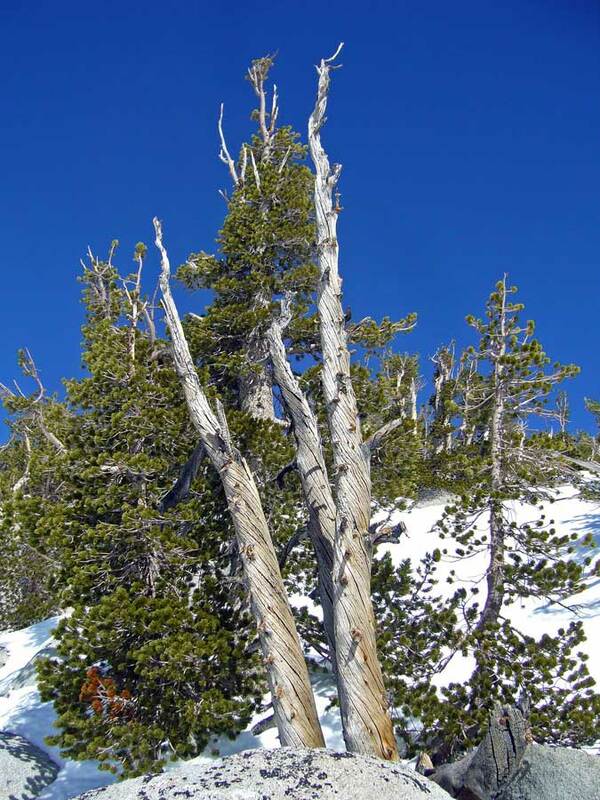 I also saw this species commonly at much higher elevations (about 8,000-9,000′) at Heavenly Ski Resort, where it took on a more stunted, windswept growth form that at first made me think I was seeing whitebark pine. The Sierra Nevada-Cascade populations of this species are assigned to subspecies murrayana, while populations in the Coastal Range and Rocky Mountains are assigned to the nominate subspecies and subspecies latifolia, respectively. The three populations lost contact with each other when their ranges shrank during the Pleistocene glaciations, resulting in subspecific divergence before expanding their ranges northward again as the ice sheets retreated. A fourth subspecies in Mendocino, bolanderi, is believed to have evolved from a soil race or ecotype of coastal lodgepole. Whitebark pine is without question the most grotesquely beautiful of the Tahoe Basin pines. Growing only at the highest elevations, it develops a spectacular windswept form through endless pounding by fierce alpine winds and heavy snowpacks. 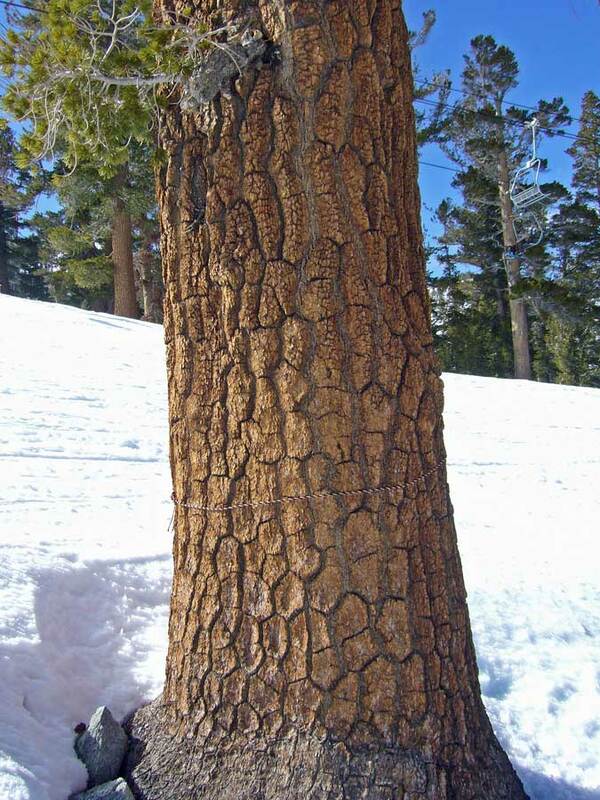 Nearly pure stands of this tree were seen near the summits at 9,000-10,000′ elevation on both the California and the Nevada sides of Heavenly Ski Resort. It is usually encountered as a multistemmed plant with upswept branches and twisted, crooked trunks, a result of its unique association with Clark’s nutcrackers, who live almost exclusively on a diet of pine nuts. These birds harvest the seeds, which do not exit the cone as in most other pines, and cache them in groups of usually 3-4, relying on their memory to find their caches at a later date. Lanner (1999) refers to a 1990 study at Tioga Pass in the Sierra Nevada, in which it was estimated that each adult nutcracker cached an average 89,000 seeds and each juvenile about 34,000 seeds. In years when abundant seed crops are produced, the nutcrackers cache many more seeds than they or their offspring can utilize. 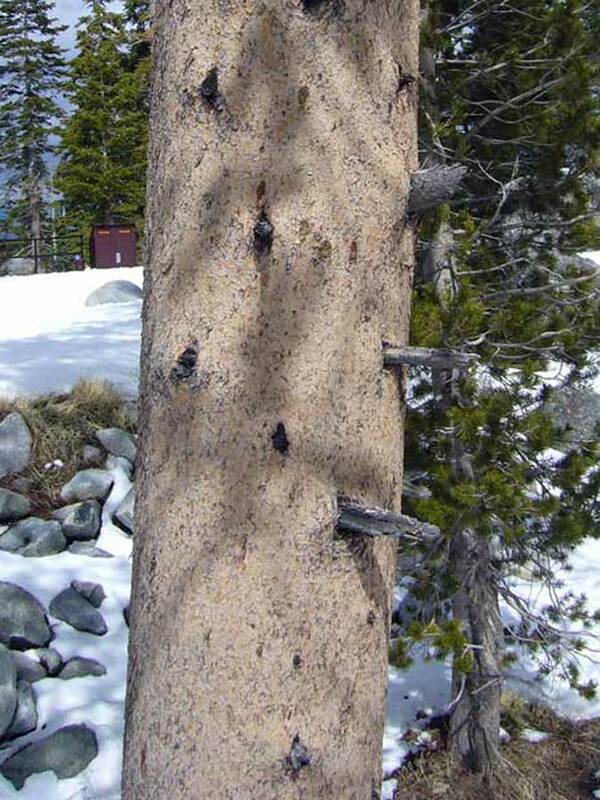 It is these unrecovered caches that allow regeneration of whitebark pine, and the majority of trees that grow from them are members of stem clumps. Whitebark pine has no other mechanism for dispersing its seeds and is thus completely dependent upon Clark’s nutcracker for its regeneration. Up close, whitebark pine needles are relatively short (usually about 2″ in length) and stout, and their bundles of five immediately distinguish this species from lodgepole pines which may grow with them and mimic their windswept form. The yellow-green needles lack the bluish cast of western white pine needles. 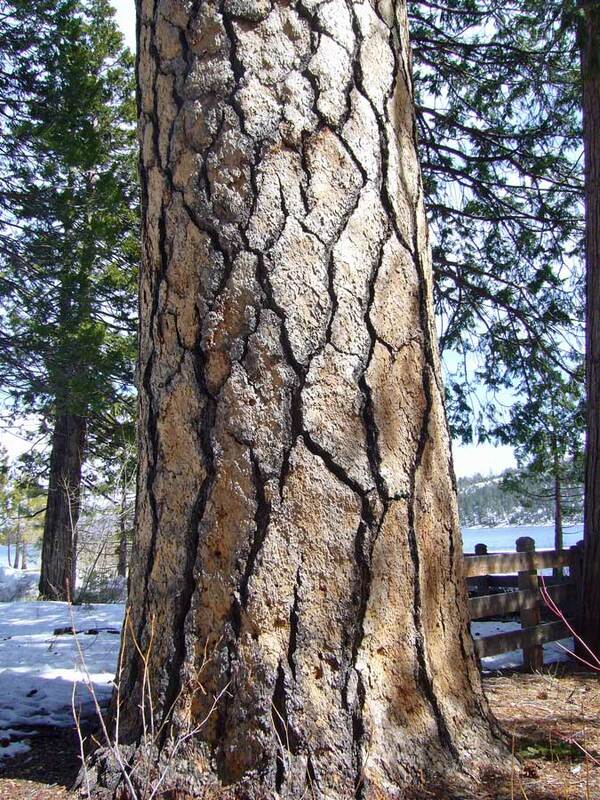 The bark on the branches is smooth like the other soft pines but had a slightly reddish cast rather than the silvery gray color of sugar and western white pine or the flaky, orange-gray appearance of lodgepole pine. In part two of this series, I’ll treat the remaining conifers of the Tahoe Basin, which include Abies and Tsuga in the Pinaceae and Calocedrus and Juniperus in the Cupressaceae. Arno, S. F. 1973. Discovering Sierra Trees. Yosemite Association, Yosemite National Park, California, 89 pp. (at only $5, this is an excellent, informative book with beautiful ink drawings). Graf, M. 1999. Plants of the Tahoe Basin. Flowering Plants, Trees, and Ferns. A Photographic Guide. California Native Plant Society Press, Berkeley, 308 pp. (another excellent resource for plants specific to the Tahoe Basin). Lanner, R. M. 1999. Conifers of California. Cachuma Press, Los Olivos, California, 274 pp. (the ultimate resource for conifers in California). Peterson, P. V., and P. V. Peterson, Jr. 1975. Native Trees of the Sierra Nevada. University of California Press, Berkeley, 147 pp. (this compact field guide was in my pocket at all times). This entry was posted in Pinaceae and tagged Botany, California, forest, Lake Tahoe, nature, Nevada, science, taxonomy, trees. Bookmark the permalink. Thanks again for a great lesson. Hey, I didn’t know you lived in Sac Town. I lived in Fair Oaks from 85-92! Yes, I lived in the Pocket and worked in Davis from 90-95. Those were some good times. They also have a good key to the pines that uses twig thickness, cone colour and bud shape as separators. Glad you like the quizzes, although I seem to be having trouble finding the right balance between hard and easy. I, too, noted the reference to differences in aroma, and while I was trying to figure out Jeffrey vs. ponderosa I tried sniffing a few tree trunks – I never did detect a distinct aroma, and I don’t know if that was because it was winter or if I needed to actually make a cut into the bark. I’ve read that unintended use of Jeffrey pine – which occasionally got mixed in with ponderosa pine used for making turpentine – has resulted in explosions on occasion due to its significantly different oleoresin chemistry. Oh, how I love ponderosas and lodgepoles! I should have known you weren’t in love with Hawn for just the geology and the rich understory, but those lofty pines. Funny thing, Hawn gets criticized by other agencies for not managing for pine, but it remains the best pine-bluestem system in the state. Thanks for the fascinating information. Thanks, Allison. Yes, those stately shortleafs are a huge part of my attraction to Hawn. I’ve been hiking there for 25+ years, and it has been gratifying to see the pine savannas expand beyond just the slivers along main road. Hard or easy depends so much on the family or genus of plants being looked at, how many similar species are in the region, and what taxonomic features have to be looked at. And ultimately, which manuals people have on hand to consult. Betulaceae is relatively easy, Pinaceae a bit more challenging. Some families and plant groups don’t lend themselves well to photo ID, and so much depends on what features appear in the photos. But overall, these are interesting exercises, especially when you do your write up at the end. Always good reading. Thanks, Huckleberry. Everything you say is true, which is why it is hard to set the difficulty level. I’m glad you like the subsequent write-ups, though. That’s the part I really like doing – the quizzes are just a prelude. I loved your post on Tahoe conifers – in fact, I love your blog. I see we share a passion for road cycling as well. Welcome – you just earned a spot on my blogroll! Sugar pines have to be my favorite among the pines – I’m sure my wife/kids got super tired of me pointing out each and every one that I spotted as we drove the west shore. I just couldn’t help it, those stately silhouettes rising above the conformity around them. Speaking of incense cedars, Vikingsholm had some of the most massive I’ve ever seen – it is perhaps my favorite of all conifers. Your writings are very informative and professional. I too like pine trees! Hi ForestWander — thank you very much. I sure wish I could take photographs like you, though. Your images are spectacular. Hi Ted — This guide to Sierra Nevada pines is really great. You thinking about Missouri hickories next? Now some of those will be hard! Yes, easy like wine – either white or red! I have a feeling Allison will cringe upon reading that comment! Across Canada, there’s a terrible problem with Pine Beetles. Some forests have great swathes of crispy, brown trees as a result of infestation. I’ve never seen that kind of damage before. Hopefully, this winter has been cold enough to put them in check. Is there a similar problem in the US? Yes, mountain pine beetle (Dendroctonus ponderosae) is an increasingly important problem throughout the western U.S. Cold winters may cause a temporary reduction in populations (looking less likely because of our addiction to fossil fuels), but the real culprit is poor management of our forests – fire suppression and emphasizing timber production over diversity in age and structure over the past century has created old, dense, uniform-aged stands that are twice as likely to experience major outbreaks compared to more open, structurally diverse forests. This last weekend I and 4 others did an overnight backpacking trip to Lower Velma Lake in the Desolation Wilderness area. I found the variety of conifers there amazing. I’m from the Pacific NW originally, so am no stranger to firs and pines, but the variety I was surrounded by this weekend was magical. I’m still reading your two posts on the conifers, but want to thank you for the information. Others in our group were curious as well, and though my knowledge was greater than theirs (I could tell general types apart) I’ve learned so much more already from your information. On my next visit to that area I’ll make sure my camera is working and take photos of the different species for my own journal. Hi Joel, I’m so glad you’ve found this useful. I wish I’d had something like this when I first set about locating all the conifers – although getting it figured out was itself a lot of fun. It is a magical place, isn’t it! Thanks for all the good info on the Tahoe pines! Our fav is the whitebark pine! You describe it perfectly! Hi Ang and Jason – thank you, and glad you like it. Yes, whitebark pine is the tops! I love plants in extreme habitats. 1. I am confused by Sugar Pine Point. 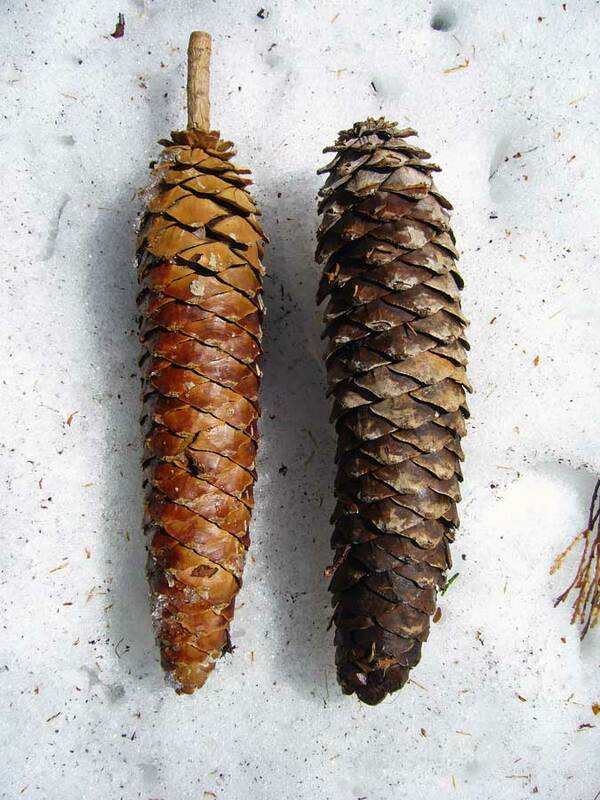 I know what a sugar pine looks like and the long large cones they produce. I stopped at the park today (2/16) to see the sugar pines but there were so many cones of another type of pine everywhere. The trees seemed to be the dominate pine tree in the campground/park, even over the entry kiosk. They were everywhere in comparison to the sugar pines. I found needles over 7 inches long in bundles of 3 associated with these trees. Can you help me figure the pine out? 2. Second question- The yellow pines….Ponderosa vs. Jeffery Pine. How do you tell the cones apart? 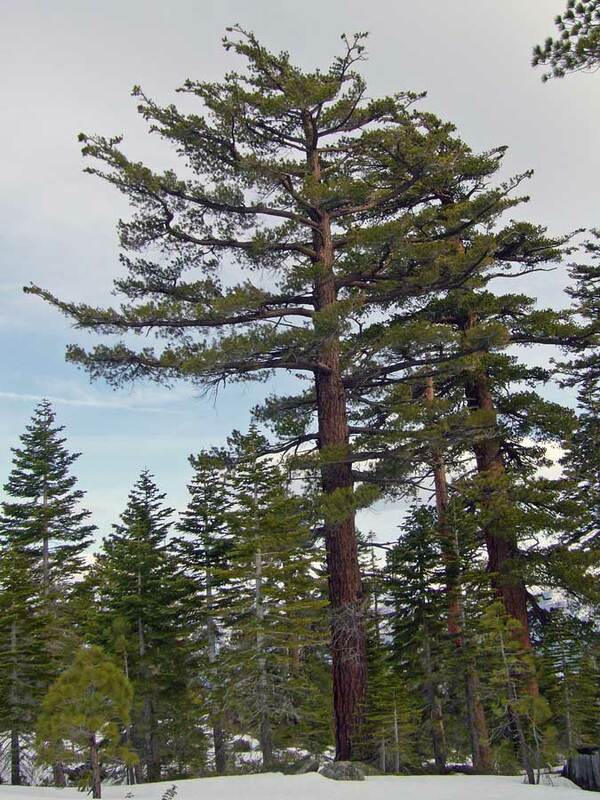 The most common pine at Sugar Pine Point is Jeffrey pine. 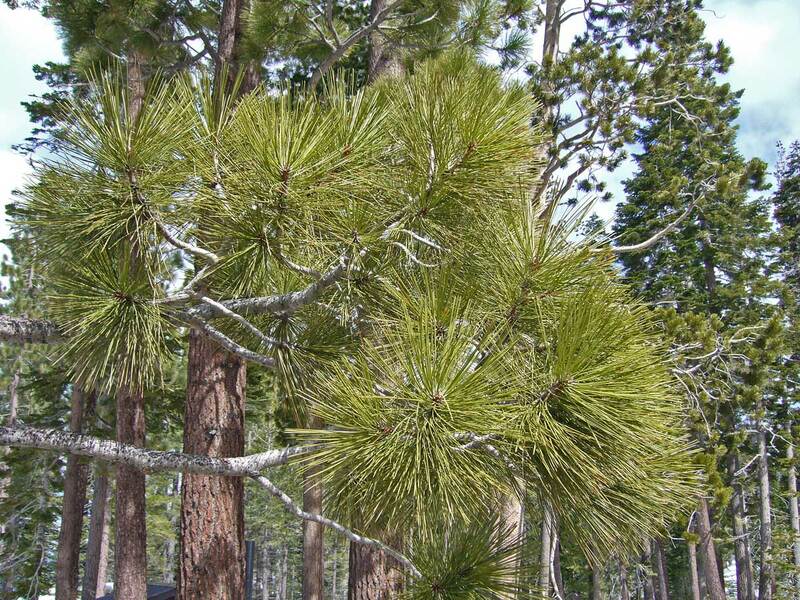 There are a few ponderosa pines there – they look very similar to Jeffrey pine because they both have long needles in bundles of 3. 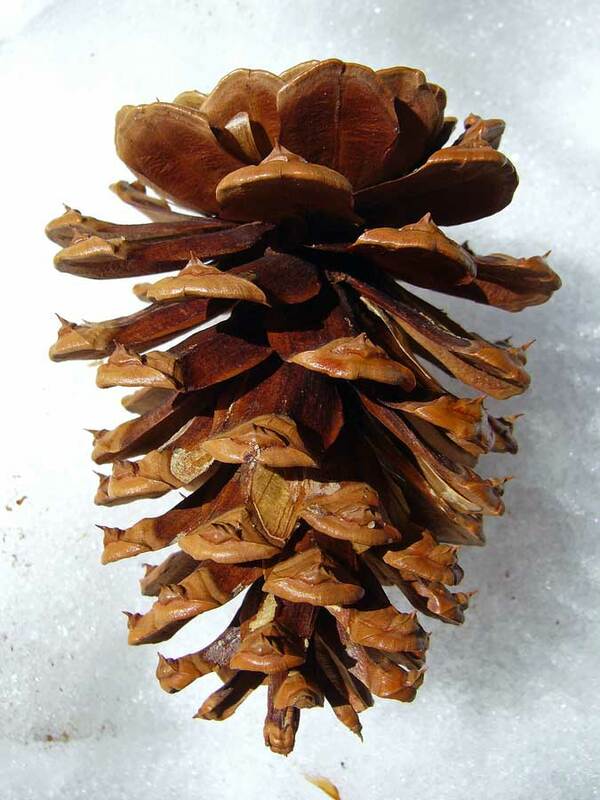 They are most easily distinguished by their cones – Jeffrey cones are larger than the hand, more tightly constructed, and have the prickles at the tip of each scale turned inward, while ponderosa cones are smaller than the hand, more loosely constructed, and have the prickles turned outward (to the point that they are actually difficult to handle because of their prickliness). Sugar pines are also there but less abundant than Jeffrey. They are easily distinguished by their shorter needles in bundles of 5 (it belongs to the “white pine” group which has 5 needles per bundle). There is also some lodgepole pine in wetter ground that has even shorter needles in bundles of only 2. Thanks Ted! I really understand! Thanks for he quick reply! I went to Lake Tahoe several years ago and while the lake, with it’s beautiful, eerie resemblance to a green ocean was breathtaking, it was the trees of Tahoe that mesmerized me. Their grandeur, mystery, scent and slow waltz in the wind has long stayed with me and is a memory I visit often. Your treatise was informative and satisfying to this arm chair naturalist. Thank You.. Thank you for such a delightful and eloquent comment. Fascinating stuff. You should lead a tree spotting tour on skis. That could make for an informative and fun day. Yes, that would be a lot of fun! I do plan to retire in the Lake Tahoe area, so maybe that is something I could do once I’m there. Ted – Loved your article. I was just on the slopes and summit of Mt Ralston in Desolation Wilderness admiring the trees. I have owned Lanner’s conifer book for years – great book! I’m a big backpacker and love the Sierra Conifers. I have a you tube channel about backpacking and decided to do a series on trees of the Sierra so people can appreciate and identify what they see on the trail. Awareness is the first step to preservation. I’m an amateur but am a certified arborist. Filmed my first video on white bark pines yesterday. Hope you entomoligists can get a handle on these beetles. There are also some awesome Western White pines up there as well as abundant red firs, and Jeffrey Pines. I always make my hiking friends jam their noses deeply into the fissures of a mature Jeffrey and they all have been able to detect the strong vanilla aroma. They don’t share my level of tree envy so it’s nice to come across an article like yours. Thanks for posting. Glad you enjoyed the article. I envy your ready access to the Sierra Nevada. I can’t wait to retire there and spend a lot more time hiking and backpacking deep into its beauty. This post was one of the best lessons I’ve had in tree identification. Thank you! Thanks Joanne. I’m glad you found it useful.